One aspect of landscape painting that causes a few problems for the less experienced artist is that of suggesting a sense of space and distance. This is especially a problem where the air is clear and you can see everything in outstanding detail for miles, thus tempting us to put everything into the composition, in quite strong detail. We usually need to create something of an atmospheric haze, sometimes within a short distance, in order to create a feeling of depth and space in a painting. The key to creating a feeling of distance in a landscape painting is to ensure that the more distant feature has less detail, less colour strength and less tonal strength than that which it is in front of that feature. 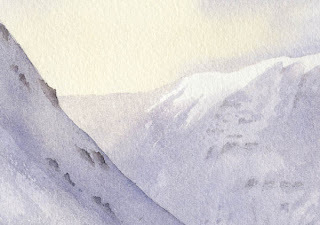 In this small part of a watercolour you can see that the left-hand mountain slope is quite a bit stronger in tone and detail than the ridge disappearing behind it, and this applies to trees, buildings and all manner of features. Make sure that there is very little detail in the more distant feature as it goes behind the closer one, otherwise this will confuse matters. This entry was posted in aerial recession in landscape paintings, David Bellamy by David Bellamy. Bookmark the permalink. What a lovely painting! Thanks for the helpful advice.